On December 30, 1960, Marisella Veiga, her mother, and her two brothers boarded a plane from Havana to Cuba. Her father fled a few months later, joining his family with fourteen U.S. cents in his pocket and the understanding that he would never see his homeland again. Needing work and thanks to a host family’s sponsorship, the Veigas left Spanish-speaking, subtropical South Florida for the frozen world of St. Paul, Minnesota. 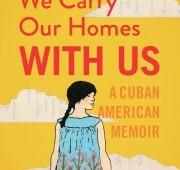 In We Carry Our Homes With Us: A Cuban American Memoir, writer, poet, journalist, and teacher Veiga frankly describes the experience of “being of two worlds but an outsider to both”, and the exiled family’s brave efforts to survive, and then thrive in their adopted home. Marisella Veiga now lives in St. Augustine, Florida. Join her at Downtown Books from 1 to 3 on Saturday, October 28. We will donate all proceeds from the event to The American Red Cross, to benefit people affected by Hurricane Maria.